Poetry took over on 4 October, National Poetry Day, in an explosion of events and celebrations! It was across the airwaves from morning to night and poets themselves gave readings the length and breadth of the country, not just in poetry venues but on buses, on trains, in metro stations and in offices, and of course in schools and libraries and bookshops and pubs. Hundreds of thousands of people shared the poetry they love with friends and neighbours, and everyone enjoyed #poetryforachange. Let us know how you celebrated! We’d love to hear all that you did, so please email us poetryday@forwardartsfoundation.org with reports and photos too. We’d be grateful if you could take the time to fill out our survey so that we can make our celebrations in 2019 even better. There is one for schools, and a separate one for other organisations and individuals. 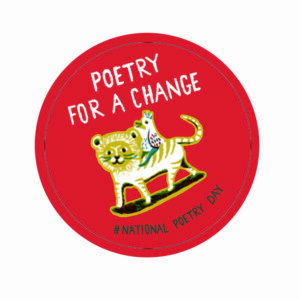 Thank you for celebrating #poetryforachange!